The following is a review of the supplement InstantATT. 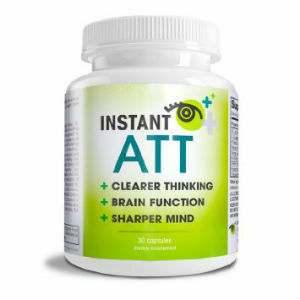 InstantATT is intended to increase focus, sharpen the mind, help the memory and enable clearer thinking. The manufacturer claims that InstantATT helps the brain to function to its full capacity. Read on to learn about InstantATT’s ingredients and what we found out when we investigated the product. The ingredients in InstantATT enhance memory by supporting neurotransmitters. They do this by increasing blood flow towards the brain, reducing stress and protecting neurons (brain cells) from oxidative stress. They can lift brain fog as well, improving procrastination and dealing with motivation. The ingredients also increase alertness by 30% according to the manufacturer. Brainpower is increased by boosting clarity and lengthening your attention span. None of these claims has been properly backed up. Furthermore, the supplement is not vegetarian and contains lecithin derived from soy, which is an allergen. This is a dietary supplement, which should form part of a balanced diet. One capsule is to be consumed a day. There are no recommendations made as to when it would be best to consume the product. InstantATT has no stated side effects. This seems purposely misleading on the part of the manufacturer as it does not seem possible that a manufactured product can lack side effects of any kind, especially as the product contains a soy-derived ingredient. This is an allergen and can cause an allergic reaction in some individuals. We would advise that you exercise caution and question a medical profession about this product before you try it. InstantATT seems to have been available on Amazon before and better value for money than it is directly from the manufacturer but they no longer sell it. Instead, a single 30-capsule bottle can be bought from the manufacturer’s website for $39.99 or three 30-capsule bottles for $99.99. There was a 6-bottle option but this option has apparently been removed because of the high demand for InstantATT. The manufacturer simply states that they have a 100% money back guarantee and that they will ask no questions. The condition that the product has to be returned is not stated, nor whether these is a time limit. Details of how to return your purchase can be found by entering the “Contact Us” section of the InstantATT website, and filling out and online form or by phoning them on 1-800-928-4127. A few samples of positive reviews are offered on the website that appears to be taken from where they were sold on Amazon. This page is no longer available and so there is no way to tell if the overall reaction to the product was positive or whether these positive reviews were specially picked out of many critical ones. It is claimed that the product is manufactured in GMP Certified facilities but there is no way to check this as the company name is not readily available and so it is not possible to see if it listed as such. The information provided on their website is quite limited. For instance, they have not outlined side effects and this seems to be information that has been purposely withheld, perhaps because it could affect a person’s decision to try InstantATT. A month’s supply costs a reasonable amount and the company has a reasonable guarantee in place that seems to have no time limit or conditions, which is good. However, there is no way to determine the strength of the product as the active ingredients are simply labelled as being part of the supplement’s formula. There is also no way to gauge its effectiveness based on reviews, as they are limited and possibly biased as well. Ultimately, InstantATT has both positive and negative points but it depends on a consumer to make up their own minds about it. Henry Costa	reviewed InstantATT	on November 20th	 and gave it a rating of 3.